Let’s dust the cobwebs off spareful and give it the honor it deserves! Breaking it down into its component parts, spare + full, gives a glimpse of just how meaningful the word can be. The pop phrase “Less is More” is similar, but what does it really mean and how can it guide us in our design choices? Let’s plumb the depths a little. Whether you chalk it up to evolution or a divine artist, the natural world clearly knows a thing or two about designing sparefully. The pairing of essential form and function is evident in the sleek shape of the fox built for speed and agility, in the simple curve of a woman’s throat, in ripples of sand birthed by the pull of moon-induced tides. Everything is there that needs to be and nothing more. The results are typically beautiful and inspiring. 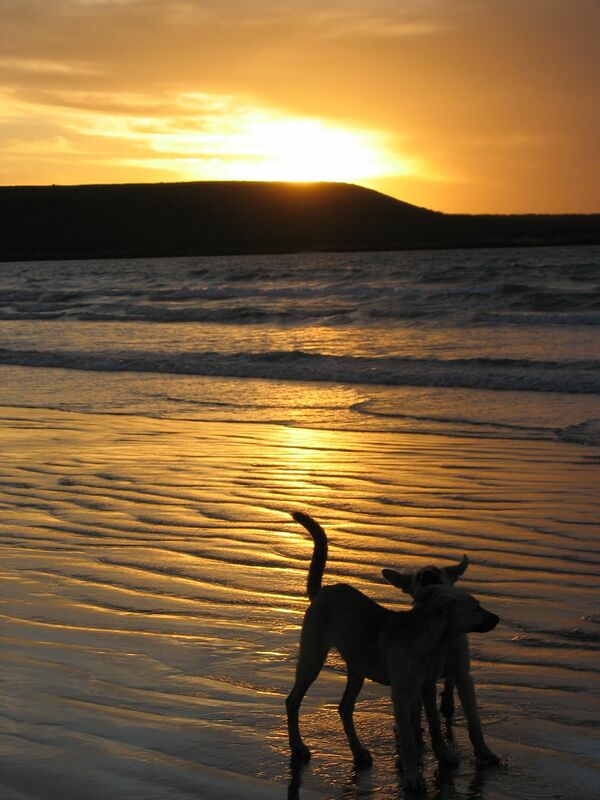 Stray pups playing on Bahia Magdalena, Baja. Going spare in music is perhaps captured most fully in experimental composer John Cage’s piece 4’33”, four minutes and thirty-three seconds of silence (and yes, I do know that in Britain spare means crazy; not sure that changes anything – ha!). I went to a performance of this piece in college and the audience had no choice but to listen for what seemed like an eternity to the incidental shifting of the musicians on stage not playing their instruments, the ambient environment around us, and every squirm each of us made. It was rather grueling, but fascinating once you started to pay attention. In addition to being influenced by the series of all-white paintings by his friend Robert Rauschenberg, Cage was inspired by a visit to the anechoic chamber at Harvard University in 1951. This is a room designed so that the walls, floors and ceiling absorb all sounds rather than reflecting them. Cage expected to hear silence but he wrote later, “I heard two sounds, one high and one low. When I described them to the engineer in charge, he informed me that the high one was my nervous system in operation, the low one my blood in circulation.” How cool is that? As with meditation, the more we can reduce extraneous noise, the more we can listen to what’s within and around us. You don’t need to go as extreme as the Cage piece to appreciate the beauty of spare design in music. This morning a concerto for solo cello performed by Yo-Yo Ma was playing on the radio. Reduced to bare essentials, its stark notes were so pure and full of longing and loss, I nearly wept. It evoked something much larger than the mere sum of its few parts, tapping into the deep well of emotions we’ve all experienced. The simplest story is sometimes the most rich. Not long ago, the Swedish vocal group Erato covered Call Your Girlfriend by Sweden’s queen of pop, Robyn. The video quickly went viral. Why was this modest, homemade video lacking all production values so popular? After all, it’s just three young women singing in a kitchen, accompanied by empty butter tubs – pretty spare. My guess is because it resonated with people. It recalled shared experiences of playing clapping games as kids. The song, while not complicated, is about a heart-wrenching social situation we can all relate to in some way or another. Plus there is just the simple pleasure of hearing sweet, harmonizing voices, in this case counterbalanced by the slight edginess of the lyrics. Pairing essential form with function creates an inspiring sense of beauty. Silence makes us tune in to what’s important. Simplicity evoking deep emotions pulls at our souls. Resonance connects us. In a world that has grown far too complicated, this is the fullness that can come from being spare. So how can these ideas in art and nature be applied to tiny house design? When most people encounter a tiny house for the first time, they are intrigued. They are drawn to the simplicity and lack of clutter. It evokes childhood memories of building forts. Whether or not a particular tiny house resonates with them depends on the way it is designed and decorated, whether they can picture themselves living in it. I’ve seen many tiny houses in person, in books, and online, and some grab me and many don’t. 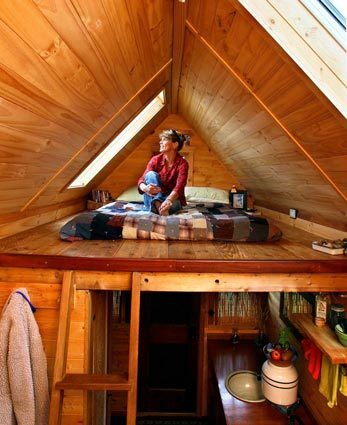 Each of us has a different sense of style and the trick to designing the perfect tiny house for yourself is to know what works and doesn’t work for you. On a cold, misty gray day in late December, I met Dee Williams at her little house to talk about the conceptual designs I was working on. Stepping inside, my first impression was of the woods. Clad in cedar on the outside and tawny-colored pine on the inside, it smelled of trees. 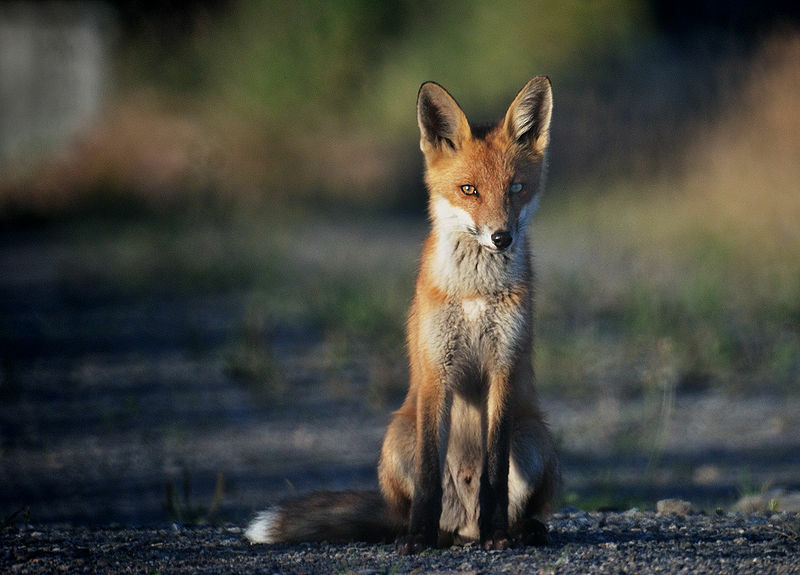 With shades made of twigs, rain smattering on the metal roof and warmth coming from a small heater, it felt a bit like entering a fox den. Dee’s house is a perfect example of spareful design. In fact, it’s a veritable haiku. One of the smaller tiny homes, it’s 12’ x 7’ with a 2’ porch. She also went minimal in terms of systems. She chose to go without plumbing, a refrigerator or oven, and only has a single stovetop burner. There’s a compost toilet and a simple solar set up. Many of the materials she used were salvaged and recycled, including her pine interior and many of her windows. Copper pipe is used as rods to hang things from; her countertop is made from a door she found. Built for $10,000, with low maintenance requirements and monthly utility bills less than two lattes even in winter, Dee’s little house has given her the freedom to be able to offer more to others. At a recent tiny house workshop, Dee made the comment, “Design for who you really are, not the social construction you think you are.” She talks about playing anthropologist with yourself, to figure out what you really need (as opposed to what you think you want). In looking critically at her own lifestyle, she knew cooking wasn’t her thing so why put in kitchen gear she wouldn’t use? While some might find it hard to relate to this much paring down, or have the courage to actually do it, Dee, after more than eight years, is still happy every time she walks into her little house. That is what defines a successful design. But the fullness from her spare approach extends beyond her own appreciation: it made me happy too. It evoked the feeling of nature, oh so dear to me. It brought back fond memories of my childhood cabin and the Japanese-style buildings at Tassajara hot springs where I go every year, deep in a mountain canyon. Unlike the more modern tiny house styles, this one resonated with me. And I’m sure it’s affected many others with similar tastes. Evocative and resonant – further signs of a good design. Here is a short time-lapse video showing a day in Dee’s little house. It’s showcased in the National Building Museum in Washington, D.C.
You can also get more of a tour in the “Little House on the Trailer” video here. Take time to be still. Listen to your neurons firing and your blood flowing. Find your inner camel explorer. Question everything, and I mean everything. What does home mean to you? How much space do you really use? Do you need that flatscreen TV? It may take some courage but buck convention if it’s not serving you. Don’t be afraid to shake up your life and habits a little (or a lot). Be ready to both embrace and let go of your past. Once you’ve stripped everything away down to your most basic needs, start to add things back in. But be very intentional about it. Don’t just add in curtains or a large refrigerator because you think you should. Find new solutions that work best for you. This is where the real creativity comes in. Surround yourself with what makes you happy, what you’re passionate about. If a spare, minimalist look lifts your spirits, make it happen. If you’re someone who loves to feel surrounded by your collections or books or art, go for it. It’s the things that you add back in that are going to define you, that make up your personal style and sense of taste, that tell your own unique story. Just be conscious about it. And really, really honest with yourself. 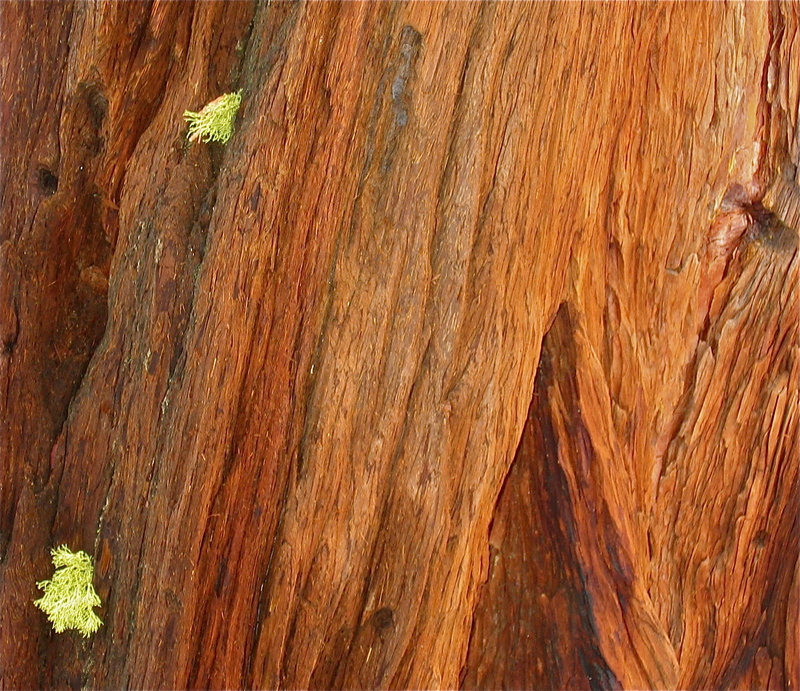 Ancient sequoia shedding its bark. Where the storyteller is loyal, eternally and unswervingly loyal to the story, there, in the end, silence will speak. What a good post. And I love your reclamation of the word “spareful.” Perhaps your discussion will kickstart the word’s reemergence into common speech! Wouldn’t that be great? I lived for a total of about 8 years over 3 different renting stints in a basic, simple 450 sq ft cabin pine cabin in the Oregon madrone-and-oak woods. I would reluctantly give it up for one reason or another, and invariably return as soon as it was available again. It felt like home to me in a way no other place I’ve lived ever has. It was a perfect space (for me) in ways similar to what you describe here — simple, functional, quiet, and, though rough, rustic, and full of holes, insects, and drafts, beautiful. During my first years of renting it, I divested myself of all the boxes of things I’d been carrying around for years–books, records, writing, fabric, letters, and everything and anything I didn’t use regularly. I wanted to be free of myself, frankly, and getting rid of the possessions that I felt defined me was necessary. Painful at times–destroying creative work can be a sad task–but liberating. I decided that from thenceforth I wouldn’t acquire or keep anything I didn’t absolutely need. I would live a stripped-down existence in a stripped-down place (nature, in the form of the wilderness/wildlife outside and my feline companions, being the real show). I recently moved away for the final time from that cabin, and what I noticed while packing up was that the objects of special meaning that I’d cared to retain were all gifts from people close to me. So, my discarding everything that was “me” cleared space for a deeper appreciation of gifts from others. 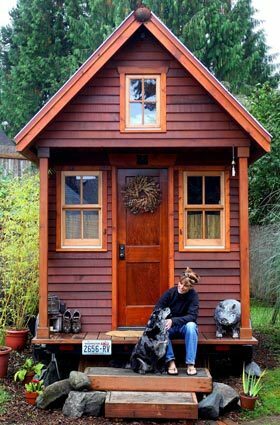 I know I could live happily in a tiny house as long as it was mobile and I could park it in a place I wanted to be. Because the “where” of my abode is just as important as the “what.” The right “outside” is just essential as the right “inside.” I should be so lucky! I’d be curious to know what you and others have to say about the relative importance of exterior and interior place when designing your tiny houses? Do thoughts about where your house will be (or where you want it to be) effect your design plans? Thanks for the great comment, Alison. That cabin was amazing – I’m glad I got to see it before you left. Hoping you will one day return or find something equally soul satisfying. And I love hearing about your process for rightsizing yourself, especially the part about the gifts from others. Kate, I am loving your posts! I just spoke with Iron Eagle Trailers and know that this is where I will get mine, so very excited!! The posts about Nature are so precious, a big reason I want to live in a tiny house is to be closer to Nature, listening to the frogs and crickets, walking out into it easily because there isn’t much house! Hanging my clothes on a line, emptying my compost from food and toilet, growing food, sitting on the front porch out of my french doors watching the sun move across the sky. And the post about how we will feel in our house. I have been living in it in my heart and mind as I choose what I want, which windows come to me from salvage places that will feel right and let me feel the air, bring the sun in to warm my house. And then the journey, the camel story, the ups and downs. 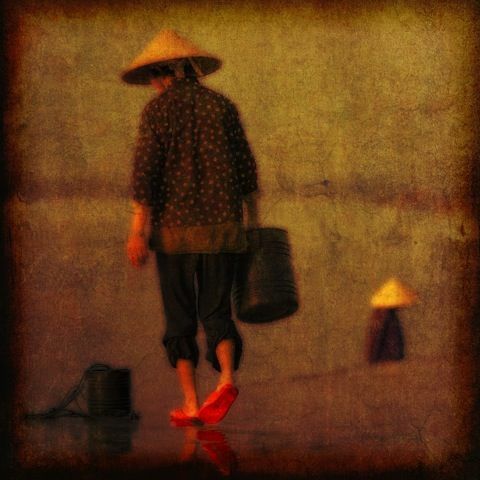 It is indeed a journey across time, into ourselves, connecting with the world as we collect the pieces of our homes and lives, at the same time letting go, finding what we really need and who we really are. Thank you for all that you write, I hope you will put it into a book someday. Thanks so much, Lisa – much appreciated and so glad the blog hits home with you. It sounds like you are starting a wonderful journey of your own! May all your dreams come into being.